When a stereophonic track is heard through headphones or over loudspeakers, the image of a virtual performance is created in the mind. This virtual performance, which exists exclusively on the record, can be conceptualised in terms of the ‘sound-box’ (Moore 1993), a four-dimensional virtual space within which sounds can be located through: lateral placement within the stereo field; foreground and background placement due to volume and distortion; height according to sound vibration frequency; and time. From the mid-1960s, the increasing shift from mono to stereo meant that producers and engineers had to contend with the notion and potential of a song's sonic arrangement or mix, resulting in a disparity of sonic placement and a diverse range of sound-box configurations. By 1972, a normative positioning of sound sources within the sound-box was established, which we term the ‘diagonal mix’. This article focuses on the consolidation of this norm by means of a ‘taxonomy of mixes’ and the utilisation of visual representations which detail the sound-box configurations of a variety of pop/rock, easy listening and psychedelic tracks from 1966 to 1972. This article is one of a series exploring the spatialization of sound sources in recorded songs and how they may be understood (see also ‘The Virtual Performance Space in Rock’, twentieth-century music 5/2). Its theoretical basis is multi-faceted, utilizing notions of ecological perception, of the sound-box, of the singer's persona, and of interpersonal distance in communication, as well as further concepts from cognitive science. It focuses particularly on image schemata and proxemics, exemplifying them across a range of genres, while also addressing them critically, for instance from a feminist perspective. Finally, it explores how this theoretical basis helps us not only to understand the contribution of spatialization to the interpretation of songs and their meanings, but also to shed light on the role of other musical domains. Analysis of the spatial elements of popular music recordings can be made by way of the ‘sound-box’, a concept that acknowledges the way sound sources are perceived to exist in four dimensions: laterality, register, prominence, and temporal continuity. By late 1972 producers working across a range of styles and in different geographical locations had adopted a normative positioning of sound sources across these dimensions. In 1965 no such norm existed. This article contextualizes the notion of the sound-box within academic discourse on popular music and explores the methodology employed by a research project that addressed the gradual coming-into-existence of the norm, which the project defined as the diagonal mix. A taxonomy of types of mix is offered, and a chronology of the adoption of the diagonal mix in rock is presented. How do we know music? We perform it, we compose it, we sing it in the shower, we cook, sleep and dance to it. Eventually we think and write about it. This book represents the culmination of such shared processes. 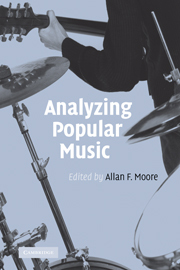 Each of these essays, written by leading writers on popular music, is analytical in some sense, but none of them treats analysis as an end in itself. The books presents a wide range of genres (rock, dance, TV soundtracks, country, pop, soul, easy listening, Turkish Arabesk) and deals with issues as broad as methodology, modernism, postmodernism, Marxism and communication. It aims to encourage listeners to think more seriously about the 'social' consequences of the music they spend time with and is the first collection of such essays to incorporate contextualisation in this way. How do we ‘know’ music? Although music has a variety of distinct audiences, one way of approaching a universally applicable response is by looking at the activities we undertake in its presence. Most widespread, of course, is listening. We may listen for pleasure, for identification, as an accompaniment to other activities (dancing, cooking), distractedly (as when watching a film) and in many other ways. In pre-modern societies, listening without any more active form of participation was rare indeed, whether that activity focused on performing itself, on some form of dance, or even on banter with the musicians: some would argue that in modern society too, the musical experience is impoverished without such participation. Many of us are either fortunate or wilful enough to insist on performing, and even composing. All of these activities may be defined as ways of ‘knowing’ music, even if that knowledge is not communicated verbally. We do, however, find verbal communication about music a seductive activity: the scholar Nicholas Cook even argues that words are indispensable in the process of our creating for ourselves meaning out of the music we listen to (Cook 1998a: 270). Verbal communication is certainly necessary for the remaining activity we undertake in respect of music – its study, the process of knowing it ‘better’. Twenty years ago, it was difficult to find any institution where popular music (as a field distinct from ‘classical’ or ‘non-Western’ musics or jazz) could be found being taught to prospective musicians at undergraduate level. There seem to be two alternative ways to argue the presence of a modernist aesthetic in an art object. The first way would see it as a necessary response to the social conditions of modernity, as exemplified by David Harvey (Harvey 1989), such that to evade a modernistic response would be received as fraudulent. This is the essence of the position laid out by the Frankfurt theorist Theodor Adorno in his defence of Schoenberg in the face of Stravinsky, of which Adorno (1973) is the most outspoken example, and it was also adopted by such high modernist post-war composers as Boulez or Stockhausen (see Boulez 1952 and Stockhausen 1989: 140). The second way would see it as contingent, as a possible response to the social conditions of modernity, one among a number of other possibilities which could be represented, perhaps, by realism or postmodernism. Recalling Lyotard's (1988) emphasis on the historical concurrence of modernist and postmodernist responses, if the first articulation can only be identified chronologically (whereby modernity and modernism are instituted simultaneously), the second can be identified aesthetically, by assuming a series of modernist identifiers. The origins of the rock band Jethro Tull can be traced back to 1966. Almost by accident they took the name of an eighteenth-century English agriculturist in 1968 (Rees 1998), and writer/vocalist Ian Anderson assumed artistic (and subsequently financial) control of the band in 1969. ‘Its enormous success was to have unfortunate consequences in succeeding years, when some truly awful “concept” albums in the style of Pepper got taken very seriously indeed by people who should have known better.’ Sgt. Pepper was the high point of a cumulative process which changed the nature of the game that was Anglophone popular music. As I have already suggested, the major available positions in the preceding few years can be summarized in terms of ‘pop’ (represented, perhaps, by Herman's Hermits or, now, the Monkees) and ‘rock’ (represented by the Rolling Stones and, subsequently, by Cream or Jimi Hendrix) with the Beatles, despite their rock ‘n’ roll credentials and the rollicking vocals of which McCartney was capable, tending towards the former. At the time, Sgt. Pepper seemed to mark rock music's coming of age, an issue I shall return to at the close of this chapter. Now, of course, with jaded memories, we think of it as ushering in an era of pomposity, with varying degrees of seriousness, to which punk rock formed the inevitable antidote. The case was not clear at the time, for although the entire pop/rock edifice was adding storeys at a remarkable rate, 1967 still supported a very strong ‘established’ popular music market in the UK, catered to by Engelbert Humperdinck (who prevented ‘Penny Lane’/‘Strawberry Fields’ from reaching No. 1), Petula Clark, Ken Dodd and the like.